I love garden markers 🙂 They come in all shapes and sizes. 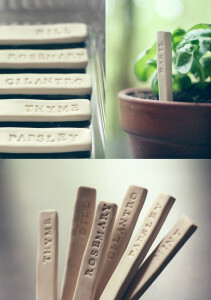 These are DIY garden markers by Amanda of Wit & Whistle. They are made out of oven-bakable polymer clay and are hand-stamped. I really like the clean look. Click below for the full recipe. P.S.